Office hygiene is an important but frequently overlooked topic for Australian employers. It’s often easier to focus on the hygiene of high traffic areas (restrooms and break rooms), but let’s face the facts: Your office desk can have up to 400 times more bacteria than an average office toilet seat! According to research from the University of Arizona, for every square inch of space, an average office desk harbours thousands of bacteria and, more often than not, this is where staff members like to eat their lunch. The same study, also found that there are 106 bacteria in the air per every cubic meter within office buildings. The findings of this research should be enough to send a warning to office managers. If office cleanliness is not taken seriously, then employee sick days and absenteeism due to illness may increase, putting unnecessary pressure on the office and its employees. What then should managers do to ensure office cleanliness is to an ideal standard? We’ve collated some tips below. Have you ever wondered why you sneeze upon entering your office in the morning? A dusty carpet can be a leading cause. Scientists believe that there are thousands of dust mites that survive on an ounce of carpet dust. The office carpet needs to be vacuumed often to reduce the dust it holds. At Intrepid Cleaning we always tell our clients that carpet vacuuming should depend on use. Vacuuming should be done daily (Monday to Friday) for high-use areas and offices of 50 employees or more. We also recommend professionally steam cleaning all carpet at least once a year. This extra care and maintenance will prolong the life of your carpet and at the same time help to minimise the health risks for your staff. Doing the simple things such as washing hands regularly, having hand sanitisers available and regularly refilling restroom consumables can drastically help to improve office hygiene. It is also important to have disinfectant wipes available for the staff to use to clean office desks. Remember that germs on hands are transferred to the desk and computer keyboards. These wipes can be used to clean the workstations regularly ensuring staff work in a clean and healthy environment. Sometimes, we keep old files and unused desks in our office just to fill the empty space. Did you know that these unused furniture and old files are breeding places for germs? Ensure you get rid of unwanted items and files that are no longer in use. Start by asking your staff to remove the items they no longer use so that they can be disposed of, and remember to promptly remove old coffee and tea cups. Experts advise against rubbish bins full of food scraps remaining in your office overnight. Bins can lead to unpleasant smells, particularly in Perth’s summer months (as air-conditioning units don’t run overnight) and can be a breeding area for germs. It is important to make sure that bins are emptied at least daily, a professional office cleaning company can do this for you so as to not burden your employees. Also, encourage your staff to separate recyclables from food scraps which don’t decompose. This can greatly improve the cleanliness of an office. So, how clean is your office? A clean office will help improve the productivity and morale of your staff, and potentially limit total office sick days. Dusty carpets and untidiness in your office cause contagious illnesses and therefore you should encourage your staff to ensure their workstation is clean always. Refill restroom consumables and encourage regular hand washing, along with regular office vacuum cleaning. 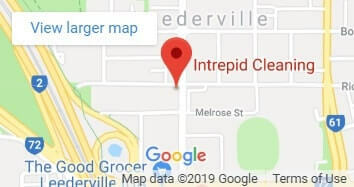 At Intrepid Cleaning we tend to obsess over the details and focus on the little things that other cleaners tend to miss. Read more about our services or contact us for a same day quote.